While I was waiting for the twist to set on the silk singles, I started spinning something else. This is from some batts I got from Spinner's Hill at MDS&W last year. I got enough of this and some teal green to make a sweater. There wasn't enough of either to make a whole sweater so I plan to ply them together. 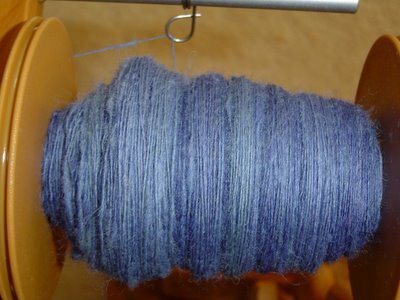 Once I finish spinning this bobbin (I should finish today), then I'll start plying the silk. I'm trying to spin at least 30 minutes a day, even if I only get to do it in 10 minute chunks. Hopefully, this will make it faster to get spinning done. I think I've figured out what socks and yarn I'll use for the Olympic Knitting, but you'll see those Friday. Have you heard? 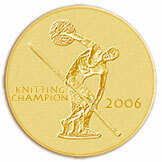 There are around 2500 Olympic Knitters and only 2400 Olympic Athletes. This really cracks me up for some reason. Maybe I need more caffeine. My First Pair of Socks for the Year Are Finished!